Speaking to the media at the end of Day 4, Buttler admitted that he thought he had seen the last of himself in Test cricket. 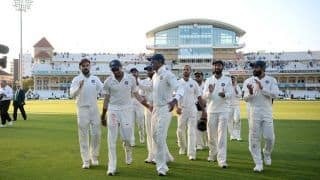 Even as India stand on the brink of winning an epic Test match, England must have headed back at Stumps on Day 4 into their dressing room defiant. A part of it stems from the fact, that chasing 521, they were able to take the game into its last day. But the bigger chunk of it belongs to Jos Buttler’s gritty batting, that not only saw the wicketkeeper batsmen notch up his maiden Test century, but also allowed England to recover from the depths of 62/4. Buttler was out of England’s Test reckoning for over a year. He went the entire 2017 without featuring for England in whites. He was called back to Test cricket in May after an 18-month absence during which he played almost exclusively white-ball cricket. To transfer his exploits in the shorter formats into the toughness of Test cricket, and to do so with so much restraint, was indeed a special effort. 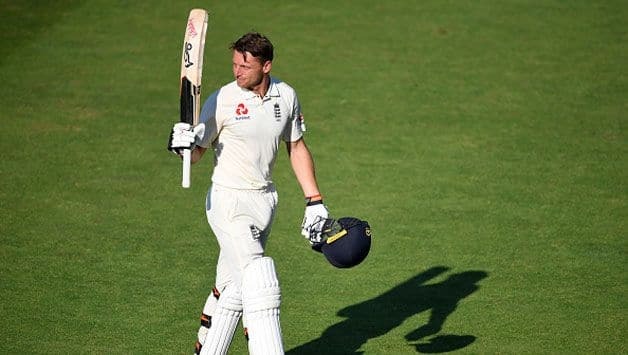 Since being recalled to England’s Test team in June after a bumper IPL run, Buttler has scored 331 runs in eight innings at an average of 47.29, with Tuesday’s century preceded by two fifties against Pakistan. Scores of 14, 67 and 80* – the last one a match-wining effort to help his country level the series 1-1 – were followed by 0, 1 and 24 versus India in two Tests. These failures, along with some dropped catches, were largely overlooked because England won in Birmingham and at Lord’s, but the middle-order concerns remained. “It’s really satisfying. It has been a long time coming,” said Buttler. “And it was, a few months ago, a million miles away so it’s a huge moment for me. I don’t think I can underestimate that feeling. I’m obviously personally delighted. A little bit lost for words but delighted. “I think definitely to prove you can do it in the middle, that’s a huge part of the feeling of it. Not just for yourself or anyone else, but to show you can do it for your team as well is maybe the biggest thing. And to feel like you’ve done something for the team and you hopefully belong. But it’s more about backing it up and doing it again because it’s not easy. Of all the explosive innings he’s played across ODIs and various other domestic T20 leagues around the world, Buttler pointed out that scoring a Test match century meant more to him than his limited-overs exploits. “A lot more fulfilment probably. It’s just been a longer time coming I think,” said Buttler. “A hundred in any red-ball game – I think it’s the first one I’ve scored for five years probably – so it’s definitely a big moment for me and it means a lot and it just proves to me I can do it and the hunger to go and do it again. I’ve definitely remembered how hard Test cricket is having come back into it. It’s really tough. It’s tough cricket, it tests you in all sorts of ways and yeah, it’s definitely the proudest moment in an England shirt. “I’m getting closer I think. It’s something I try to do is read the situation and play accordingly so it’s pleasing to know that I can do that. There will be different times that different innings are required. That’s all I try and do in cricket is try and read the situation and play as I feel like should do. “I think it shows in Test cricket how it ebbs and flows. For twenty minutes it feels impossible and then for twenty minutes you feel like you’re in control and playing well. You can’t underestimate how much luck plays a part. Human error, dropped catch and I wouldn’t be sat here today either. So I think trying to focus in the moment and stay in your zone and your bubble and play each ball on its merit and within your game plan is all you’re trying to do, I think, for that period of time. And if that means they bowl well and you play out four maidens you’re trying to trust your defence to get through that. Even as England collapsed in the first innings, Buttler tried to hold one end up for as long as possible during his 32-ball 39 before he holed out to Shardul Thakur at long-on. But there would be no such need in the second innings, as he and Ben Stokes forged an alliance of 169 runs, making India wait for 57.2 overs in search of their fifth wicket. “It was very important for us today to turn up and show a lot of character and a lot of fight and not give it to India easily and make them work hard and we did that really well throughout the day,” said Buttler. “Even the two guys there at the end making sure we do come back tomorrow. It showed that no matter what it is, we’re not going to roll over,” Buttler said.